For more information about this event, please contact Broken Board at brokenboardmtl@gmail.com. 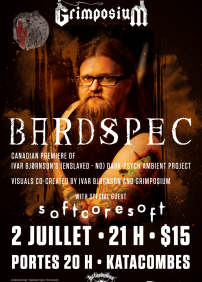 Grimposium proudly presents BARDSPEC, the Canadian premiere soundscape performance of Norwegian composer Ivar Bjørnson (Enslaved), with special guest softcoresoft. This event is part of The Norwegian Invasion, also presented by Grimposium. Ivar Bjørnson (songwriter, founder and guitarist of Norway’s black metal pioneers Enslaved) describes his BardSpec, project as “Electronic Dark Ambient-Psych wherein the listener is invited into weird and wonderful soundscapes, and where deep minimalism meets cascades of psychedelic harmony and esoteric noise”. The music will be complemented by live manipulations of film co-created by David Hall and Bjørnson, with additional visuals by Vivek Venkatesh and Jason Wallin. softcoresoft is a Spanish-born, Montreal-based DJ and producer. She has played at various venues around the city including Phi Center, Datcha, Ritz PDB and several underground raves. Her interest towards gender questions in electronic music led her to play with DISCWOMAN in Montreal in 2015. Every month, softcoresoft hosts a music show on n10.as, Montréal's online independent radio. softcoresoft focuses on techno of the dark, acid, EBM-infused kind. She also draws from jacking styles with tasty basslines. Other genres she includes in her sets are: house, global hybrid, minimal/dark wave.